Its been a long while since my last update so i thought id fill you guys in. School has put the roadster at a complete standstill and side work to make some cash has taken over. 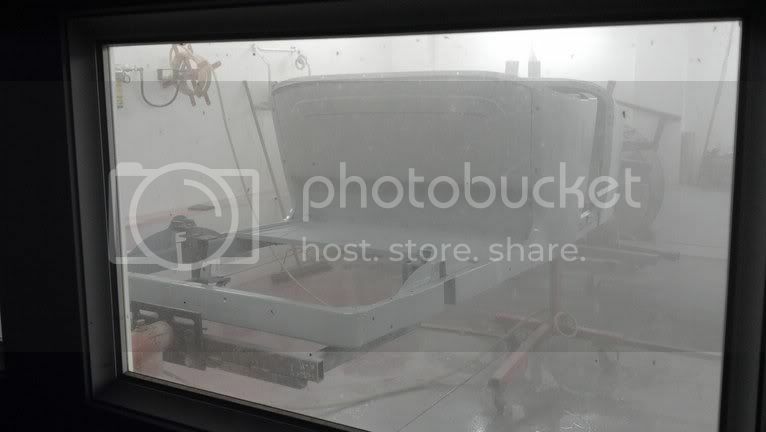 But my spring break is this week so i took the roadster over to my buddy's shop and I've been working on it there all week getting the turtle deck fit and everything buttoned up on the tub so it can go in the booth this weekend for paint. 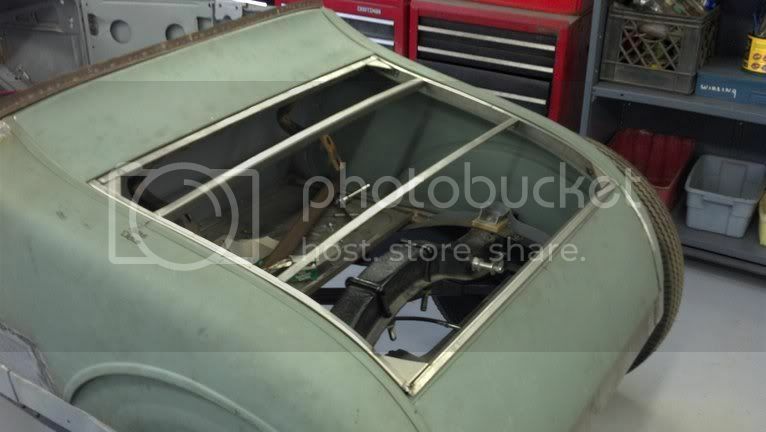 Today i fixed the radius at the bottom of the bun panels to the rockers now fit and the door closes without rubbing. That was after i shimmed up the body with some oak blocks. And i also fixed the driverside quarter. 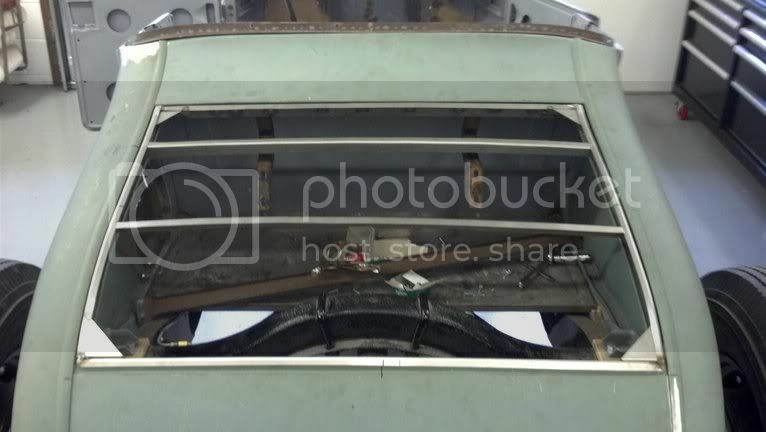 The original problem was the quarter panel was too long. So we tried shortening it to fit the sub rails but that messed with everything to the point where nothing would fit. So this evening i relengthened the front of the quarter and just tacked it all together. 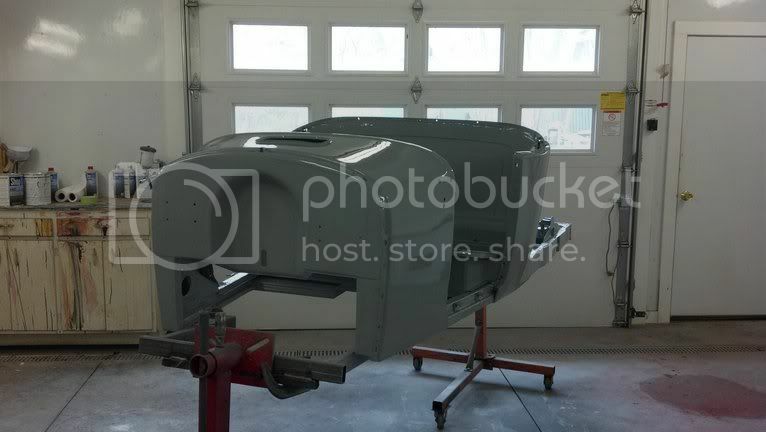 Hopefully it works so i can get started on blocking the whole car out and getting it ready for paint on sunday or monday. Fanastic work! I'm just buying a 28 RPU shell for my build so very apropos. Love your shop too - especially when it's clean! 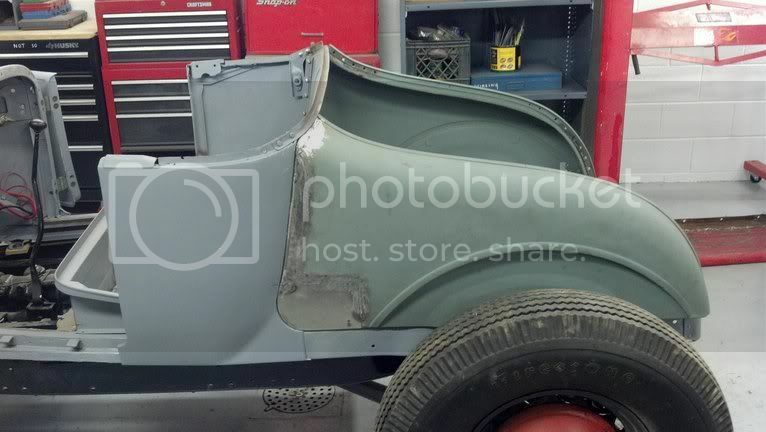 Well i spent most of the day working on the inner structure for the decklid and mounts for hinges. 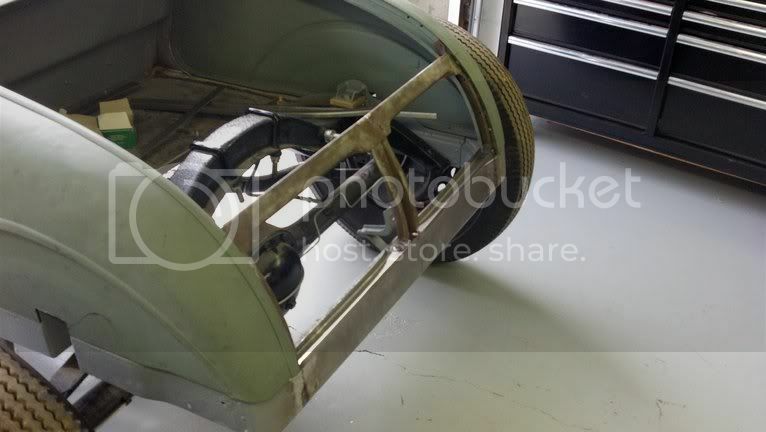 Once i got all the mounts set, the hinges didn't work the way it was set up using a pair from '46 ford coupe. So i need to figure something else out but that'll be next week. I got the body in the booth and ill be finishing up all the odds and ends on the body on the homemade rotisserie just for this body. You and I have the exact same taste, I LOVE that car, absolutely beautiful look. And you are doing a bang up job of building it too, just beautiful. 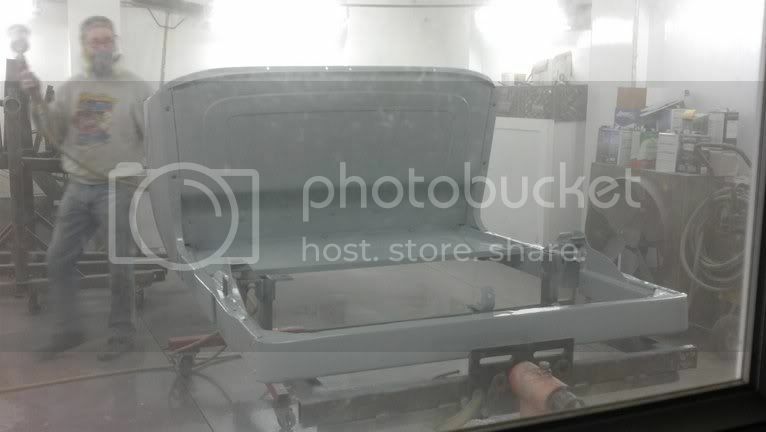 Well the car went in the booth last night and i spent most of the day finishing up little odds and ends on the car and bondoed the back half of the tub. So I'm hoping to get it in epoxy and high build by the time i go home tomorrow night. 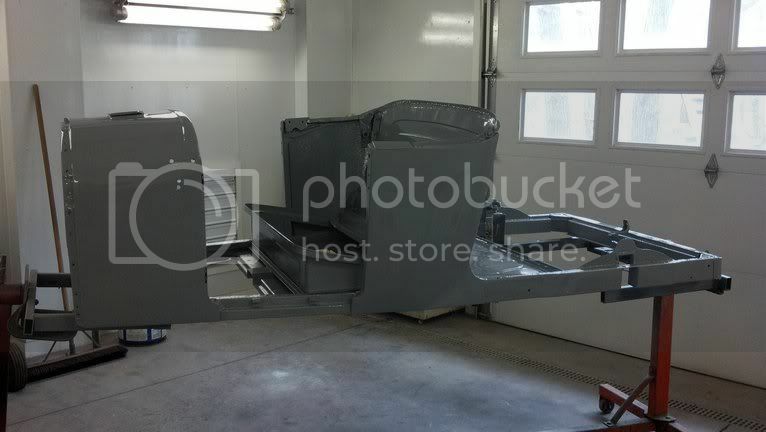 Maybe ill have some color on the underside and inside the tub after classes on monday. 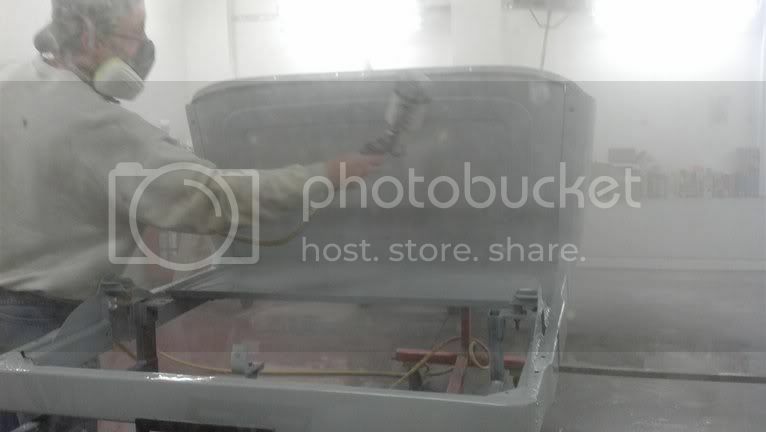 After a long night of sanding, my car is finally painted! The main tub has paint on it, just waiting for the doors, rockers, and turtle deck. I couldn't find a green that i liked so i ended up going with the same gray i painted the engine. 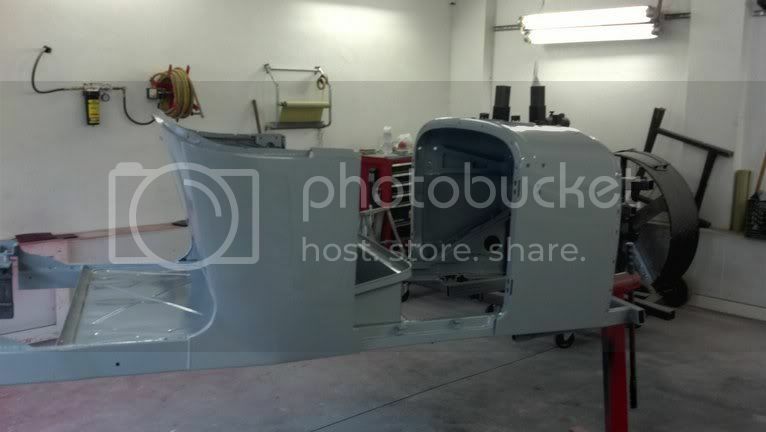 Its almost like a ford 8n gray but it looks amazing. 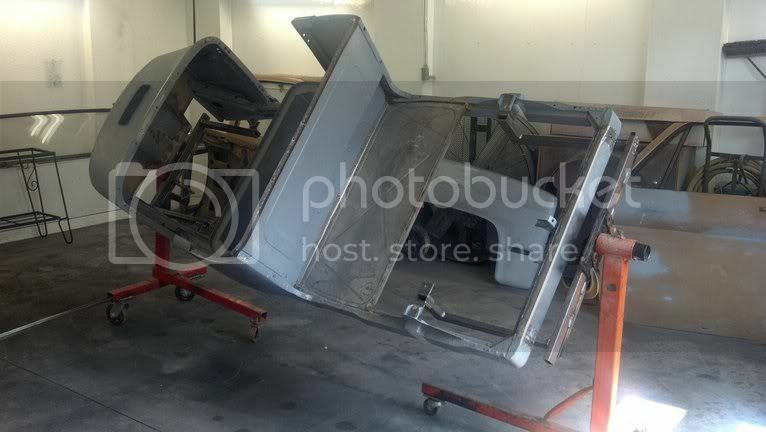 Should have the body back on by friday after i seal and undercoat the bottom side. But its one step closer to being ready for the showdown. Awesome! The fire wall is really nice, just perfect. That is coming together really sweet. 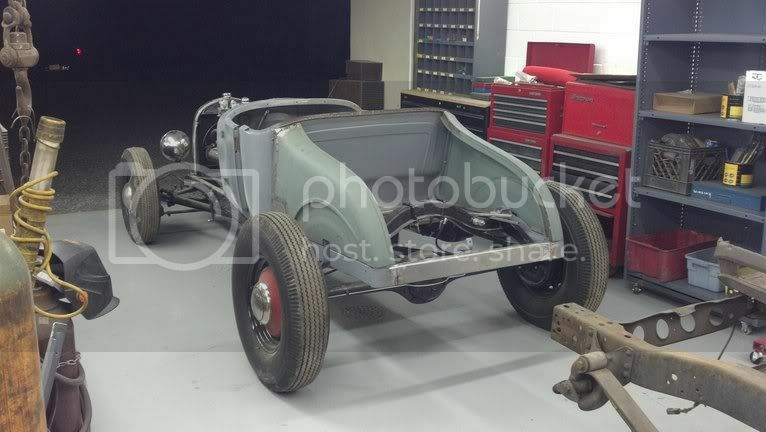 I enjoy watching the birth of another hot rod. 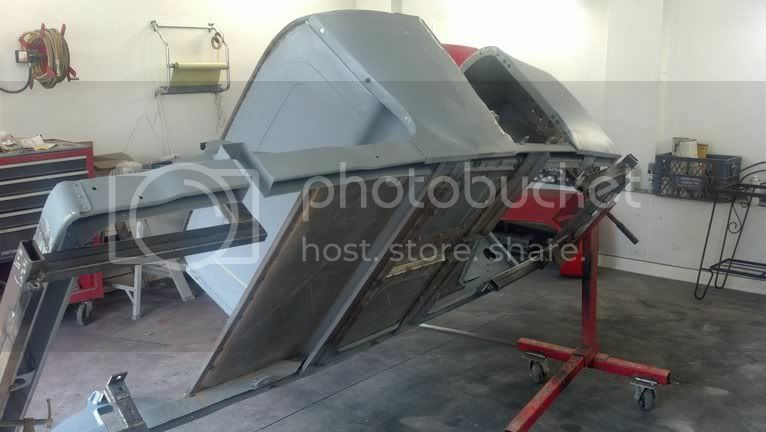 I got the whole bottom of the body undercoated and got stuff to wet sand and buff in a couple of days. Looking good! I hope you're finding a little time to sleep, you've gotten a lot done. Nice work! What a great project! 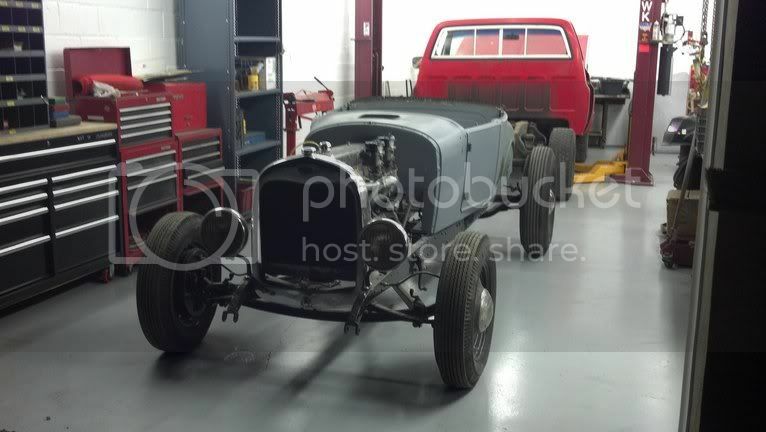 My favorite Hot Rod is a '27 T Roadster, your's looks fantastic. I'll be following along. Really like your choice of engine and drivetrain. You've really got the body and frame looking good. My son found a good 27 cowl out in the desert south of Bonneville, no cancer,, We are still looking for a back good half. I have enough projects and don't want to do as much patch work as you did. Another son wants to build a 27. 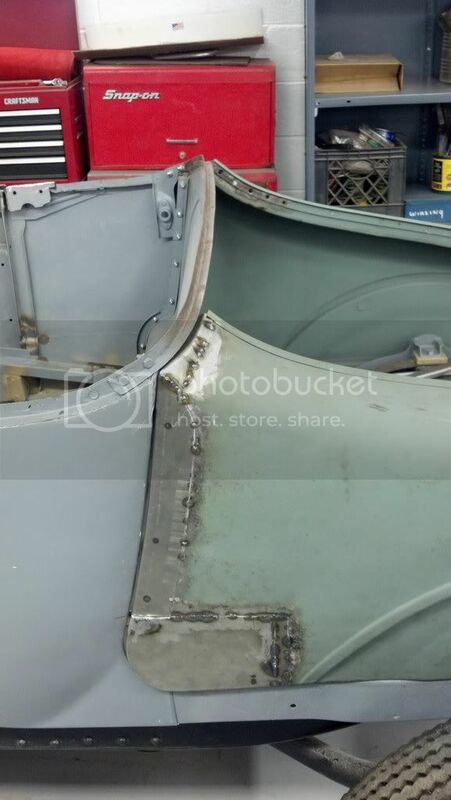 When I built the deck lid for the 29 nash I made the inner structure 1 1/2 inch smaller then welded flat strips hanging out.At the time I thought I might want a rain gutter and weatherstrips I then laid it over the hole and scribed the opening, then trimmed allowing for the hem overlap and gap. I clamped the skin sheet over the frame and scribed it then used the brake to just make slight crease for the sides. The college has a magnetic brake, It can work like a pan brake, Lay the sheet on the table, line up the marks then put the top clamp irons on and step on the pedal The Electro-magnatic holds it down to bend large pieces like you can do with a finger brake. I did a 90* plus bends on the top and bottom , hammered them down a little then used the brake to crimp them, the slight crease on the sides gives a good hammer line to hand work the sides. I watched a couple guys over work their projects on the english wheel and get too much crown . I took the easy way out and punched 105 louvers .